RACKETT'S LAKESIDE REHEARSAL RETREAT: With a new, brilliantly recorded CD coming out on Scamaphone and a 7-day Irish tour looming, Rackett gets ready to do some serious rehearsing for Saturday's 8 p.m. show at the Community Park North Amphitheater. (From left): Nigel Smith, Lee Matthew, Bobby Lewis, Paul Muldoon, and Stephen Allen. The band does not rehearse in a garage (the 3-car garage is getting an overhaul anyway) but in the basement of Nigel Smith's house, which is about as close as you can get to Lake Carnegie without being in it. New York photographer Oliver Morris took the picture. Rackett is playing like a band with a mission these days. Their new record, Resistance, whose release is being celebrated Saturday at 8 p.m. with a free concert at the Community Park Amphitheater off Route 206 North on Mountain Avenue, makes the “three-car-garage-band” label they’ve been going by look a bit disingenuous. 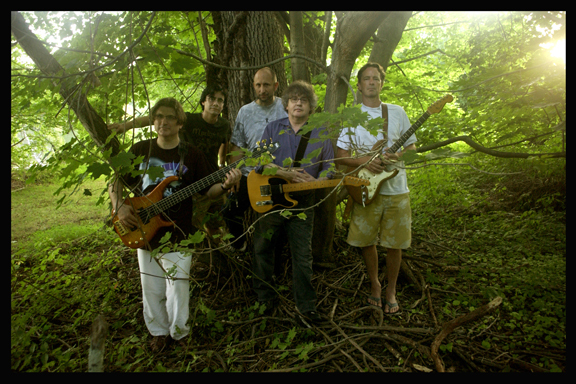 The same line-up has been playing together for 18 months now and have scored successes in Manhattan at Joe’s Pub and the Bitter End, as well as wowing the crowd at an MTV event at the Bowery Poetry Club (“People were standing on the tables”). A week from Friday they start a seven-day tour of Ireland that will take them from Cork up to Belfast and conclude September 2 with a concert at Dublin’s Project Arts Center. Princeton Borough, along with some committed neighbors, is moving toward putting a run-down, though beloved, neighborhood jewel back on the map. A design firm, Edgewater Design, LLC, of Millburn, was given a $39,000 contract with Princeton Borough to conduct design work on` Harrison Street Park, concluding a multi-year process that could now result in a public process, with a final design proposal by the end of the year. Edgewater is also expected to prepare bid documents for potential contractors hired to implement the firm's design instructions. For this Princeton Shopping Center location in front of the familiar fountain in the courtyard, anything other than a bookseller would seem completely inappropriate. So when Chestnut Tree Books suddenly closed two weeks ago, leaving behind a full inventory, and a coffee station, a note quickly appeared on the door heralding the inevitable: another bookstore was on its way. And yes, it's an independent. The show was supposed to be held in the Albert E. Hinds Community Plaza adjacent to the library, but gray skies and scattered rain that forced the event indoors did not keep the mixed crowd of kids and adults from filling the Princeton Public Library's Community Room last Thursday for the Wizard Rock Concert. Nor did the cheering fans seem to mind that the doors opened half an hour after the announced time of 6 p.m.